Includes 30 Wedge Blox pieces. 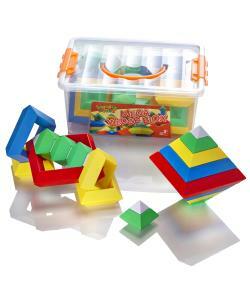 Wedge Blok are large, easy to grasp geometric blocks that nest and stack creating amazing 3D structures. 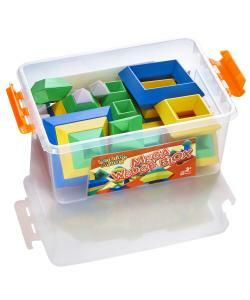 Wedge Blox introduce children to spacial awareness, angles, colour matching and free play. The perfectly nesting design of Wedge Blox building blocks assures that there is no wrong way to build. This open-ended building set introduces the spatial world of angles, colour-matching and creative free-play designing. The easy to grasp form of Wedge Blox blocks are built out of geometric shapes that nest, stack and come to life with every colourful design created.